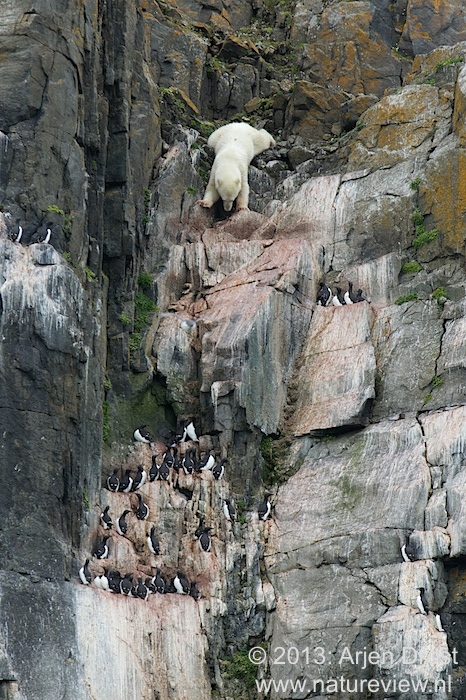 Today I received the news that my picture of a Polar Bear climbing down the Alkefjellet bird cliff was highly commended during the Global Arctic Awards 2014 in the Polar Bear category. I feel honoured and proud to find my picture in between this series of great Arctic images. The image is a great memory, shows rare behaviour and inspires me to keep making images like this, showing this fragile world to the outside world. But first, I enjoy my ‘prize’. Proficiat. I remember this picture. Very special. Congratulations. i recall very well the fascinating series of images that you posted on that amazing encounter. Ik herinner me de situatie nog prima, heel bijzonder! De opname is er helemaal naar om Award Winning te zijn. Proficiat !! !